For once it wasn’t snowing or raining on the eve of the 1st of May. 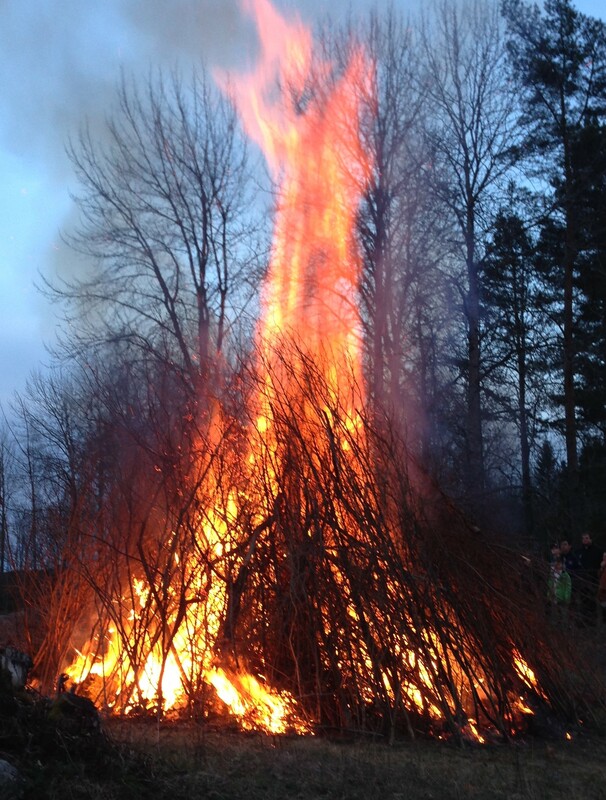 It was still a bit chilly though and the warmth of our local Valborg night (from the German Walpurgis night) bonfire was welcome. Historically Valborg is derived from the Viking fertility celebrations that took place around April 30th, where the arrival of spring was celebrated with bonfires at night. The actual purpose of the fires was to scare off witches and evil spirits. A practical use for the bonfires was also to scare off predators such as foxes before the livestock were let out to graze on May 1st. In the Middle Ages, the pagan Spring ritual became associated with Saint Walpurga who was declared a saint during this time of the year. A welcome to beautiful May. Local variants of Walpurgis Night are observed across Europe in the Netherlands, Germany, the Czech Republic, Slovenia, Sweden, Lithuania, Latvia, Finland and Estonia. This entry was posted on April 30, 2016 at 9:34 pm and is filed under Sweden. You can follow any responses to this entry through the RSS 2.0 feed. Both comments and pings are currently closed.